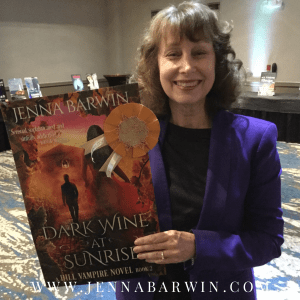 At the 2018 OCC RWA Birthday Bash, Dark Wine at Sunrise received the BEST TITLE award. The Orange County Chapter of the Romance Writers of America (OCC RWA) holds its annual meeting in October, and this is the second year they’ve given the award. Dark Wine at Sunrise is the second book in the Hill Vampire series. 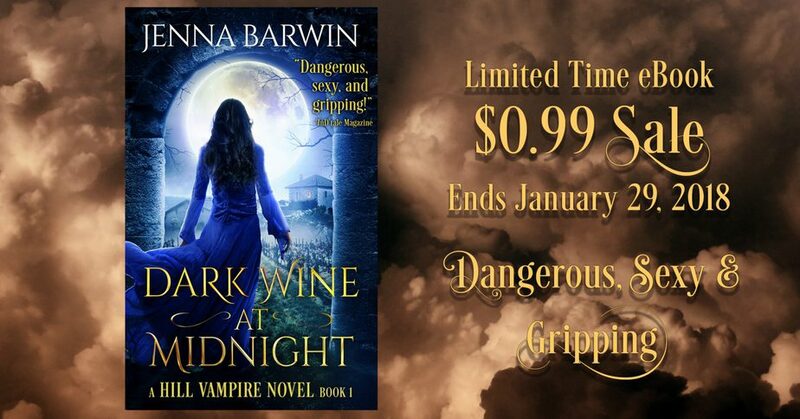 Escape into the mystery, romance, and political intrigue of the Hill Vampire vineyards. Dangerous and seductive, the suspense will grab you and not let go. June 17, 2018 / Jenna Barwin / Comments Off on Fierce Fantasies Giveaway for Paranormal Romance & Urban Fantasy Lovers! Enter the FIERCE FANTASIES GIVEAWAY and you could win a Kindle Fire 7, one of four Ebook Prize Packs, or one of two Amazon Gift Cards. Ends June 25, 2018. No purchase necessary. Void where prohibited. Want to find out what happens next with Henry and Cerissa? 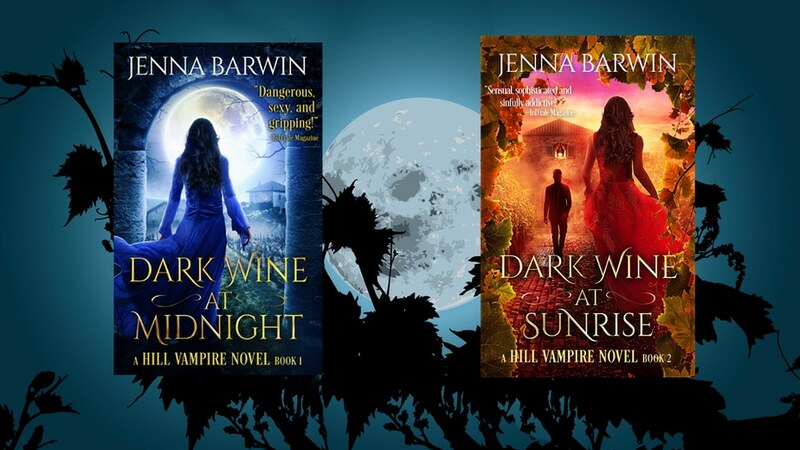 Dark Wine at Sunrise, book 2 in the Hill Vampire series, released today! You can buy the eBook or read on Amazon in Kindle Unlimited, and print books will be available soon. Research scientist Cerissa Patel has only one desire: to feel her lover’s fangs slip into her neck for the very first time. Once they become blood mates, no one can keep them apart. Cerissa’s relationship with vampire Henry Bautista violates a centuries-old law, and the town council wants her banned from their secret community. If they have their way, she’ll be separated from Henry forever. As if that isn’t enough, Henry is still in danger. The would-be assassin lies in a coma, and Cerissa is no closer to knowing who targeted Henry—or why. To make matters worse, her own people forbid her from becoming a vampire’s mate. They aren’t sure what Henry’s bite will do to her and want her focused on her original mission: tracking down the vampires behind a ruthless movement to enslave mortals. I hope you enjoy Dark Wine at Sunrise! Want to find out what happens next with Henry and Cerissa? 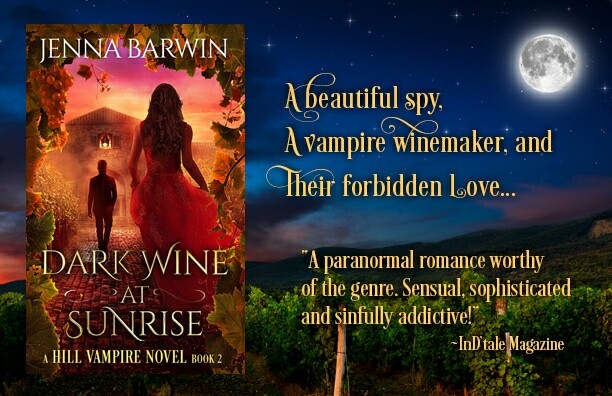 Dark Wine at Sunrise, book 2 in the Hill Vampire series, releases March 14th! During the preorder period, it’s on sale for $2.99. After release, the price will go up to $4.99. Grab it now at a reduced price! And of course, it’ll be in Kindle Unlimited for at least 90 days. Add it to your queue and starting reading on March 14! 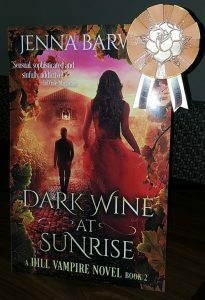 Click the graphic to go to Amazon.com to purchase Dark Wine at Sunrise! 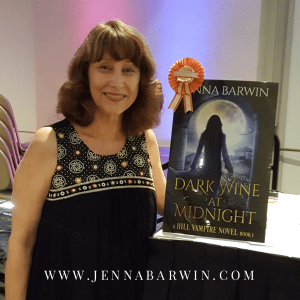 At the 2017 OCC RWA Birthday Bash, Dark Wine at Midnight received the BUY IT NOW award for book cover design. The Orange County Chapter of the Romance Writers of America (OCC RWA) holds its annual meeting in October, and this is the first year they’ve given the award. Special thanks goes to Momir Borocki who did a great job designing the cover of Dark Wine at Midnight. 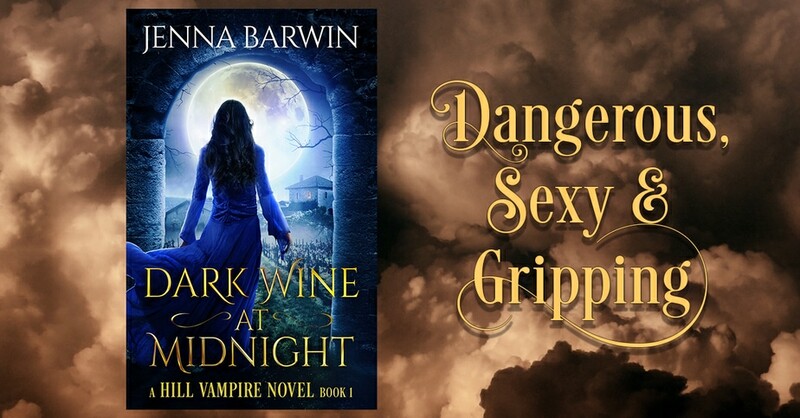 The cover expertly captures the mystery, romance, and political intrigue of the Hill Vampire vineyards, a dangerous and seductive romantic fantasy, where the suspense will grab you and not let go. Take equal parts suspense, mystery, and love story. Stir in a little local politics, an exclusive vampire community set in a vineyard, and a strong cast of characters. Heat it up with a mid-story reveal. Once the lovers combine, add a good measure of steam. Top it with an ending you didn’t see coming. Partake carefully–it creates an intoxicating brew.